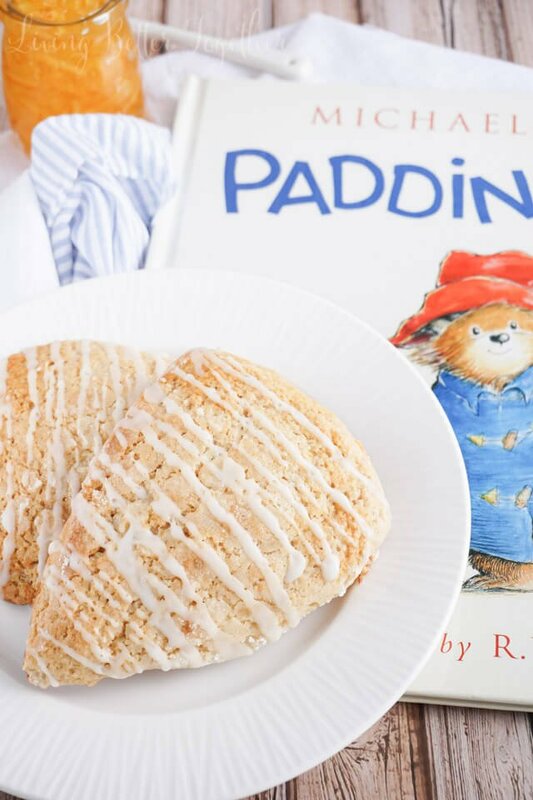 These Orange Marmalade Scones, inspired by A Bear Called Paddington, the classic children’s book, are lightly sweet and simply delicious! Plus they’re ready in just 30 minutes! I’ve always been an avid reader, and whether you are or not, I think we all have those books that helped shape our childhood. For me, it was Blueberries for Sal, Pony Tales, The Island of Blue Dolphins, Misty of Chincoteague, Ella Enchanted, The Castle in the Attic… okay, okay, you get the idea. There are a lot of books from my childhood that hold a special place in my heart. However, one stands out among the rest: A Bear Called Paddington by Michael Bond. You want to know why it stands out to me – because of there’s food involved. Just kidding! Okay, maybe only a little bit. 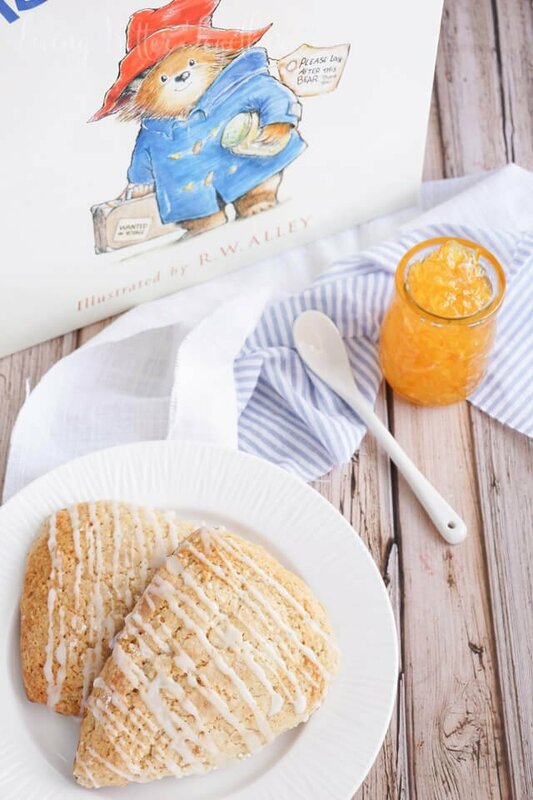 While it is such a sweet and fun set of stories and Paddington is such a great storybook character, it’s the orange marmalade that always brings me back. I simply can’t eat the stuff without thinking of Paddington Bear and his many jars of sweet orange marmalade. After reading Paddington for the first time, I wanted orange marmalade on everything. Toast, crackers, cookies, I was slightly addicted to the stuff. Yet now, somehow it’s been years since I last had it. Not okay. Last summer when I discovered that they were making a Paddington movie, I may have let out a squeal, and Matt may have looked at me like I had three heads. He just doesn’t get it… oh well, maybe I’m alone in my love of Paddington and marmalade, but I don’t think so. 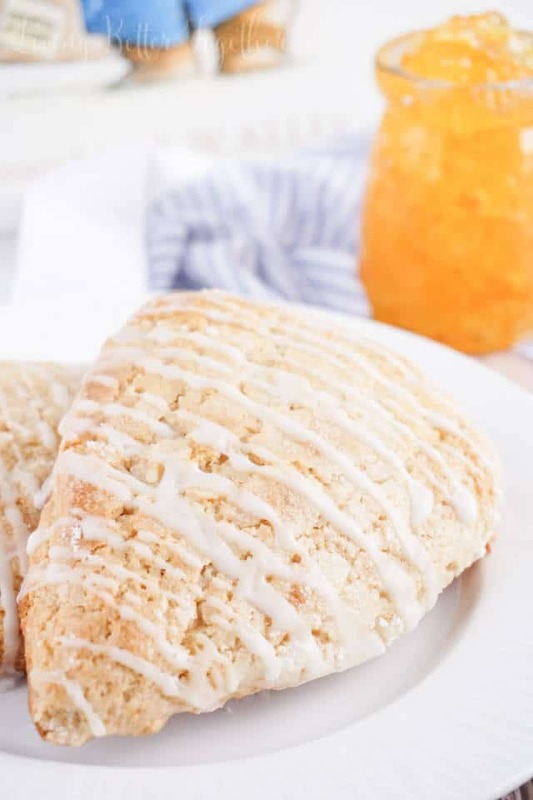 Anyways, now that the movie is finally coming out on Tuesday, I can’t wait to rush home from work and enjoy it with a batch of these Orange Marmalade Scones. 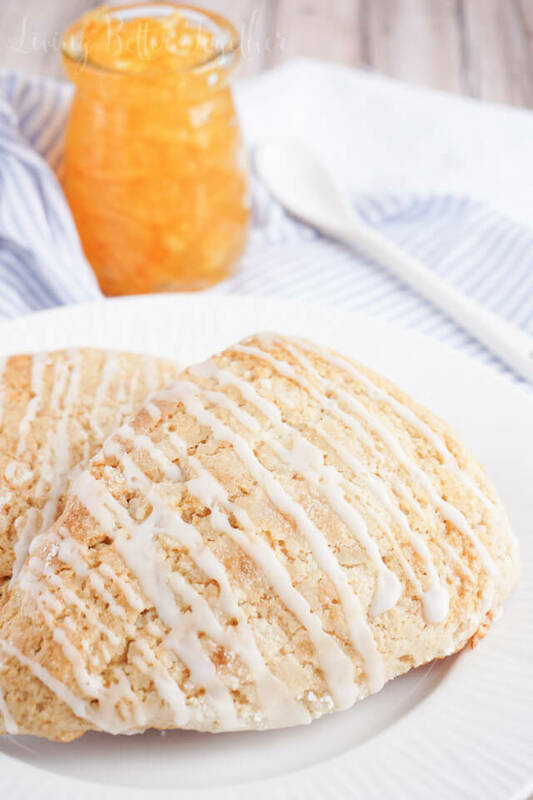 These scones are so simple to make, they take just 30 minutes start to finish, making them the perfect addition to brunch! They’re laced with sweet orange marmalade, dusted in sugar, and finished off with a simple sugar glaze. 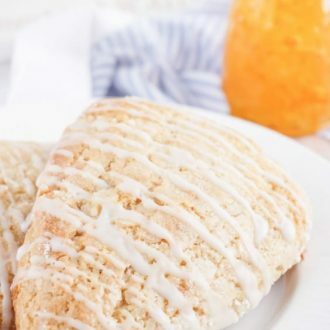 Like most scones, they’re slightly dry and are best enjoyed with hot tea! 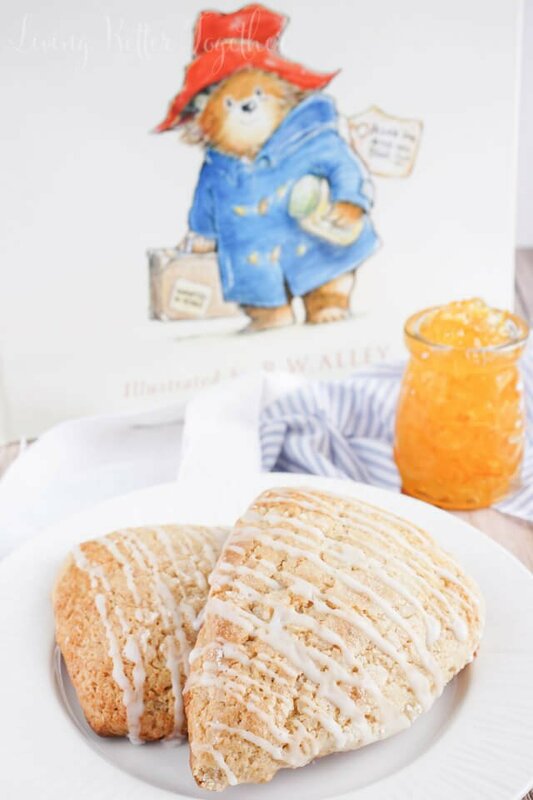 These Orange Marmalade Scones, inspired by A Bear Called Paddington, the classic children's book, are lightly sweet and simply delicious! Plus they're ready in just 30 minutes! In a large bowl or stand mixer fitted with a paddle attachment, combine flour, 1/3 cup sugar, baking powder, salt, and cinnamon. Mix in the butter cubes and marmalade until mixture is crumbly. Slowly mix in half & half until mixture is evenly combined. Transfer dough to a lightly floured surface and knead about 10 times, keep a little extra flour on hand should areas of the dough become too sticky to work with. Use your hands to pat and mold the dough into an 8-10 inch circle. Brush dough with the slightly beaten egg and dust with the remaining tbsp of sugar. Use a large knife to cut into 8 wedges, or just score the circle. Transfer scones to prepared baking sheet and if you cut them up individually, make sure to space them at least 2 inches apart. Bake for 9-12 minutes until edges are gold brown. Whisk together icing ingredients in a small bowl and then drizzle on baked scones. Aadapted from Taste of Home. 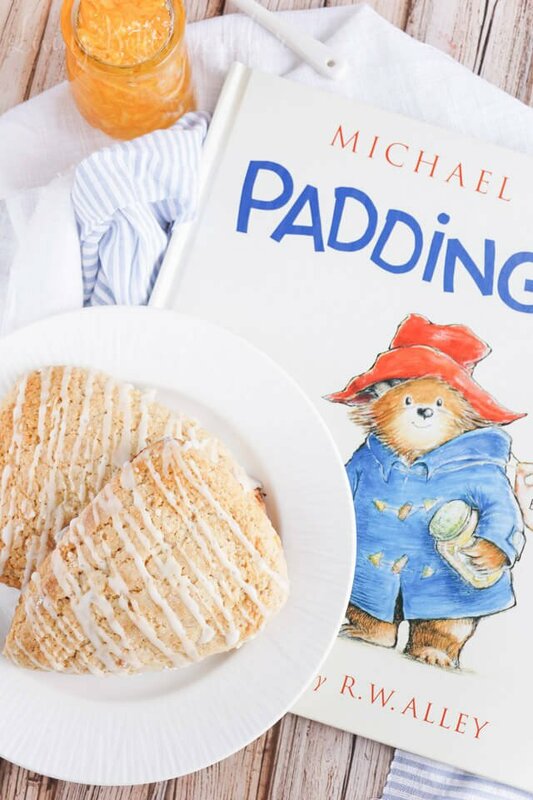 Oh how I love Paddington and orange marmalade and scones! Such a lovely post! I happen to be on a scone kick! These sound amazing!!!! I baked 8 batches of scones last week! Haha, I noticed you had posted scones today too! But 8 batches, that’s craziness! At least the craziness tastes good though, right! The dough was super goopy and I had to add an additional 1/2 cup flour plus the flour I put on the counter top to keep the dough from sticking while kneading it. I also had to bake them for 16 minutes rather than 9-12 as recommended. I wish I’d read your comment before I dumped the whole 2/3 of half and half in my bowl! It probably needs half that amount. I probably added close to 2 cups additional flour to fix it. They are in the oven now so we’ll see what affect that has on taste/texture and cook time. Maybe it’s the type of marmalade I used? There was just way too much moisture in my dough. I also wish I had read your post. What a waste. It should be 1/4-1/3 cup of half and half. Put it in a little at a time and incorporate after each addition. Is it possible to substitute for the half and half? These look delicious but all I have is milk. Thanks! I’ve never made them with regular milk, so I can’t say how much it will impact the recipe. Like others have posted, my dough came out too moist. I had to add an additional 1.5 cups flour for the dough to stay in a circle to be cut into the triangles. Even with the additional flour it was very difficult to cut the scones. The recipe I usually use for scones uses 2 c flour, 1/2 c cream, and doesn’t have the moist marmalade. I’m going to try it again with significantly reducing the amount of cream. The scones turned out pretty well. With the additional flour, the marmalade flavor was very subtle. I would like to have it be more pronounced. We’ll see how it goes next time with the changes I plan to make.